Marjorie McLean was born at Ladner, BC, on March 25, 1903, the second child of Duncan McLean and his wife, Margaret (nee Clark) McLean of lot 29, front of concession 9, the Badenoch district of Puslinch. Marjorie was of Highland Scottish stock. Her great-grandfather was Donald McLean, one of the first six Badenoch settlers. Her grandfather was “Little Peter” McLean, also known as “Peter the Councillor” McLean, as he was a member of Puslinch Township Council. Her brother, Peter McKenzie McLean was born in 1901 and her sister, Christina McLean (Mrs. Elgin Patterson) was born in 1904. Her youngest sister, Mary Margaret, born in 1906, died in 1907, at less than a year of age. Her parents returned east and Marjorie grew up on the farm in Badenoch and attended Badenoch School. She completed grade 10 at the Guelph Collegiate Institute in 1917, at the age of 14. During 1918-1919, she attended Business College in Guelph. Her first job was as a stenographer and book-keeper at Harris Woollen Mills in Rockwood in 1924-25. From 1925 to 1929, she was stenographer and book-keeper with the Department of Agriculture in Milton. In 1929, she enrolled in nursing school. She graduated from the Hamilton General School of Nursing and received her registration on July 15, 1932. During 1932-37, she was employed as general duty nurse and dental assistant at Mountain Sanatorium in Hamilton. For four months in 1937, she worked as a surgical nurse at Herman Keifer Hospital in Detroit but returned to Canada to become an operating room nurse and assistant superintendent at Essex County Sanatorium in Windsor. From 1942-44, she was employed as first aid nurse by the Ford Motor Company in Windsor. In Windsor, she maintained a lovely apartment at 249 Pillette Rd., #11. To cheer the boys and hear them curse. Bur you’ll soon learn they’re all real guys. But I bet they’ll all like our nurse - McLean. And when we’re bowling, too. May it bring memories of us - to you. 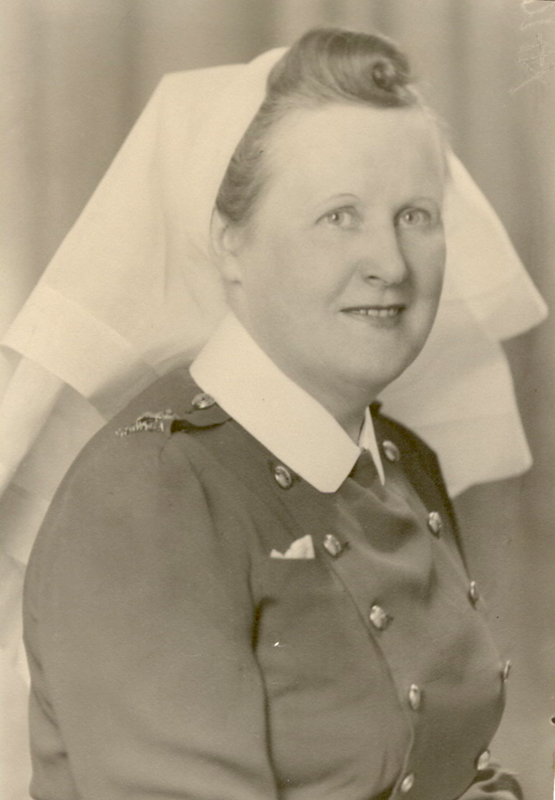 Second Lieutenant Marjorie McLean nursed at Ipperwash Military Hospital, which was attached to the London Military Hospital in London, Ontario. She was promoted to Lieutenant on August 10, 1944. On October 17, 1944, she was posted to the Military Hospital in Weston, Ontario (now part of Toronto). On May 12, 1945, she was assigned to the Embarkation Travel Unit and on June 6, 1945, she left port on the first of three trips on the Canadian Hospital Ship Lady Nelson. Throughout the depression in the 1930's, prior to the advent of the war, travel overseas was still largely the prerogative of the wealthy, not something a girl raised on a farm or even a nurse could afford. The war bought this opportunity. As well as being a terrifying nightmare, it was an adventure. Like most Canadian and American servicemen and women, Marjorie made the most of her chance. And, she kept souvenirs. It began with letters from the Department of National Defense, verifying her enlistment and date to report for duty; then cards from her co-workers at Ford Motor Co., wishing her well when she left the company; and a typewritten list of the required items in a enlisted nurse’s outfit and receipts for purchase. In Toronto, she attended a classical concert in the Great Hall at Hart House in the University of Toronto, with selections by Liszt, Bartok and Bach. At the Royal Alexandra Theatre, she took in a production called “The Great Mr. Handel”. She kept the programmes. When she was assigned to the Lady Nelson, she journeyed by train from Guelph to Montreal and from Montreal to Halifax and kept her tickets. Built by Cammell, Laird and Co. at Birkenhead, England, the Lady Nelson was the first of a fleet of five Caribbean cruise ships known as the “lady ships”, owned by Canadian National Steamships, first steaming from Halifax on December 12, 1928. It travelled between Montreal and Halifax, through the West Indies, carrying passengers on cruises and produce between the two worlds - grapes and apples to the Caribbean and bananas to Canada. In March 1942, it was torpedoed and almost sunk at dockside by a German U-boat in Castries Harbour in St. Lucia. The ship was raised, towed to Mobile, Alabama and refitted as the first of Canada’s two floating hospitals, the second one being the Letitia. It was relaunched in April 1943. 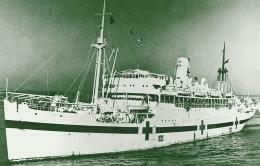 Operated by the Royal Canadian Navy, it was staffed with seventy medical personnel and held an operating room, x-ray equipment, autoclave facilities, pharmacy, as well as patient wards, storage for medical supplies, kitchens and dining room. Within the next three years, it transported 21,099 wounded Canadians home. From the Lady Nelson she kept: her identity card and her Canadian Red Cross Identity Certificate; dinner menus, including one for V-J Day; letters, cards and telegrams from friends and notes from other nurses. While with the navy, Marjorie used layovers in England to see the sights, attend the theatre and make a trip to Edinburgh and Inverness in Scotland, the land of her ancestors. She kept as souvenirs from London: the Ontario Service Club London Guide and a sheet entitled “The Ontario Service Club, While You are On Leave in London Recommendations”; a map of the subway system; programmes from the Lyric Theatre where she saw a play, “Duet For Two Hands”; from The Playhouse, where she took in “Lady From Edinburgh”; the Piccadilly Theatre, where Noel Coward’s “Sigh No More” was playing; the Prince of Wales Theatre, where a musical show by Flanagan and Allen and Florence Desmond was presented; The Palladium for a musical by George Black called “Happy and Glorious”; photographs and post cards of notable buildings; a list of exhibits at Madame Tussaud’s Wax Museum; a pamphlet on Jacob Epstein and his stone sculpture “ Jacob and the Angel”; and a receipt for the Regent Palace Hotel. From her trip to Scotland she kept: a booklet entitled “Edinburgh War Time Guide”; a pictorial map of old Edinburgh, with notes; a receipt for the Shelbourne Hotel in Edinburgh; a pamphlet on Edinburgh Castle; a “Guide to St. Giles Cathedral” in Edinburgh; a receipt for the Station Hotel in Inverness; a receipt from John Forbes in Inverness for a tartan; an “Official Guide to Scottish War Memorials”; and a sprig of heather. All of this, Marjorie pasted into a scrapbook, which has survived to this day. It is a trip back in time to look through it. In April 1946, with this work completed, the Lady Nelson was transferred to repatriation duty - carrying healthy personnel home. After its war work ended, the ship continued to ply the Caribbean until November 1952 and was finally scrapped in 1968. Marjorie was transferred from active to reserve status on March 12, 1946. She was awarded the Canadian Volunteer Service Medal and Clasp on April 11, 1946. In 1947, Marjorie McLean developed an acute case of rheumatoid arthritis. An I. D. /Information card from Windsor Medical Services notes the onset of an acute illness on September 15, 1947. At that time, there was little available to treat this disease, except cortisone, which had a very harsh effect on the stomach. The same card states that the condition was considered chronic by March 15, 1948 and further lists it, on September 15, 1948, as not yielding to treatment. She was no longer able to work at the Ford Motor Co., where she had returned. With her brother, Peter, who was single also and her brother-in-law, Elgin Patterson, whose wife, Chrissie had died at the age of 38 in 1942, she purchased a house on Victoria St. in Morriston, now #15. She suffered a great deal, as the joints of her hands and feet became swollen, deformed and immobile. By about 1954, she was confined to a wheelchair. Despite this, she continued to write to friends and relatives, holding the pen between the knuckles of her bent index and second fingers. She still added to her scrapbook, also: a newspaper clipping with photo of her close friend, Captain Beatrice Girard, Nursing Sister; cards and letters from Beatrice from her post-war work in Africa; and souvenirs of their holidays together in Quebec and Northern Ontario. She made frequent trips to Sunnybrook Hospital in Toronto, as well as to Westminster Hospital in London, ON for treatment and several times was taken by ambulance in emergency situations. On November 11, 1949, during one of her stays, she attended a Remembrance Day Service there and saved the programme, also placing it in her scrapbook. Marjorie McLean died on February 15, 1967, at the age of 64. Written by Marjorie Clark with thanks to Lois McLean and The National Archives of Canada. First published in “Wellington County History, Vol. 28, 2015”, the journal of the Wellington County Historical Society.